A few weeks ago I had the pleasure of exploring the North Carolina Outer Banks for the first time. I’ve been eager to visit for a long time, but when you are aching for the ocean it’s actually quicker to go to Myrtle Beach in South Carolina. 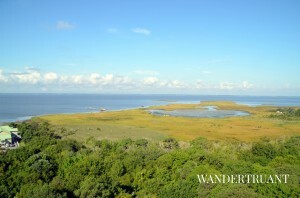 During the four day stay on the Outer Banks, I explored as much of these unique barrier islands as possible. Wild horse tours, lighthouses, and ferry rides were part of the adventure! I set a personal goal for the trip to see as many lighthouses as we could access. Lighthouses on the North Carolina Coast are set roughly 40 miles apart, which makes it feasible to see multiple structures in a day. However, some can only be accessed via water or air, making the commute much longer, so unfortunately it was not feasible to see more than a few during my period on the islands. 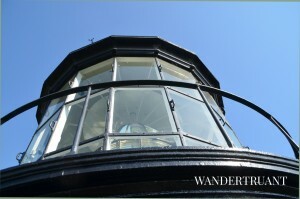 The first lighthouse on the agenda was Currituck Beach Lighthouse, located on the northernmost point of the Outer Banks. 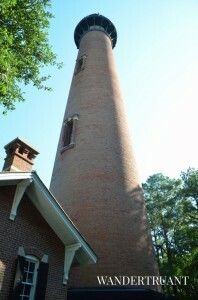 This unique lighthouse is located in the heart of the small village called Corolla. I was staying in Kitty Hawk, which is roughly a 45 minute commute. The drive was pleasant and peaceful, and as you make your way into Corolla the lighthouse can be seen towering above the trees. Getting there early in the morning was an excellent idea, as the grounds were vacant and I was one of the first climbers. 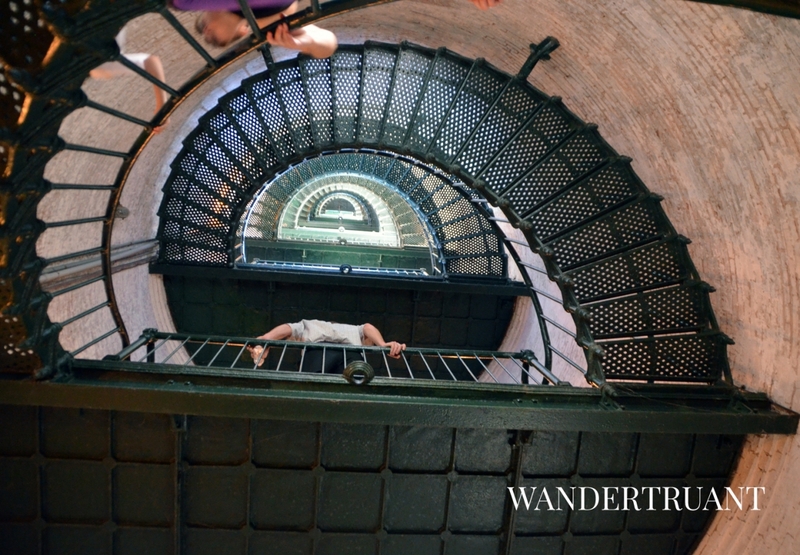 The lighthouse is open to the public, and for $10 you can slowly ascend the wrought iron spiral stairs up to the balcony of the lighthouse. A walk around the balcony affords you a 360 degree view of the village and the North Carolina coast. 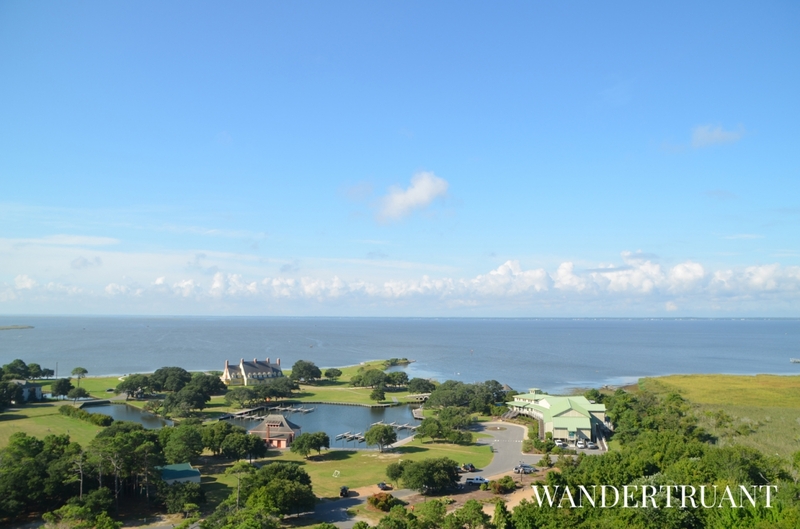 If you can handle the 220 steps to the top of the 160 foot lighthouse, the breathtaking view is worth the effort. Unlike other lighthouses, the Currituck Lighthouse was not painted. Built of approximately 1 million red bricks, the exterior of the lighthouse remained natural, as a way of distinguishing the light from other regional lighthouses. 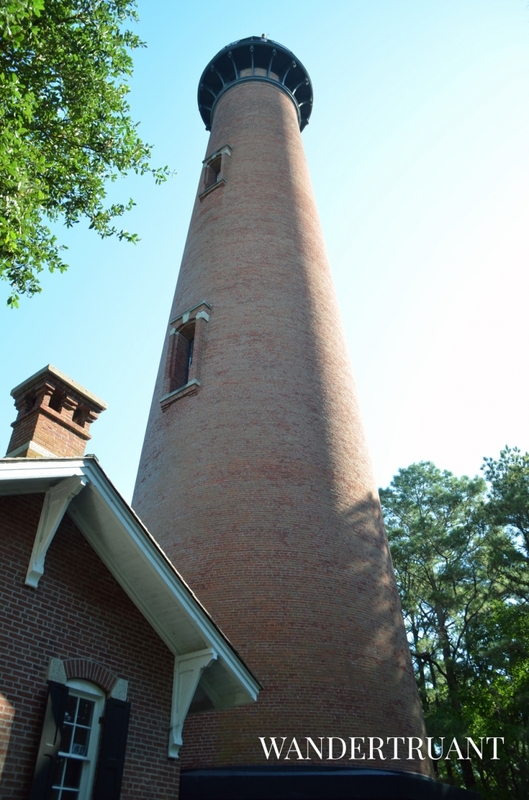 Finished in 1875, the Currituck Beach Light was the last major brick lighthouse to be built on the Outer Banks. 30 years ago, the lighthouse and grounds were in bad need of repair but no one was willing to step in and preserve the buildings. 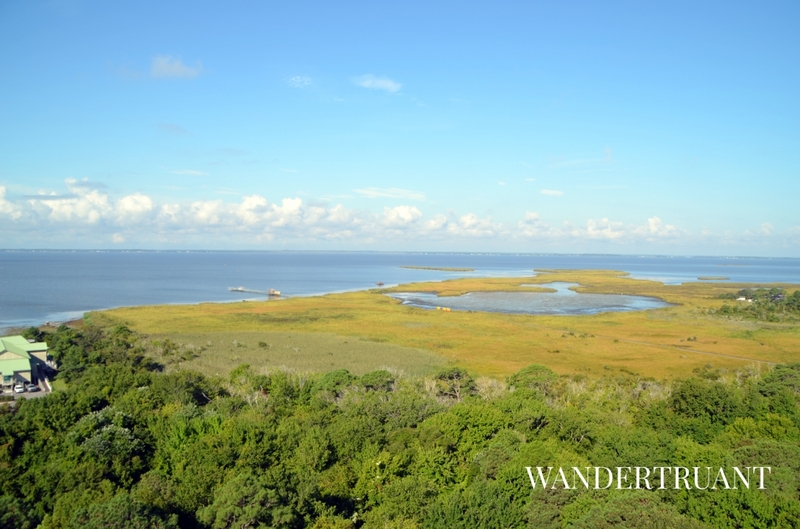 The Outer Banks Conservationists, or OBC, were formed to repair, preserve, and maintain the property. 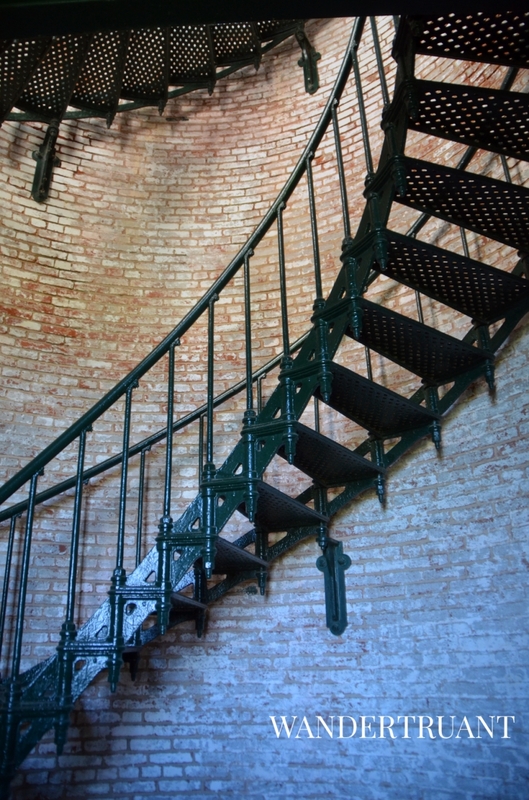 The $10 climb fee for the lighthouse helps support the lighthouse, lightkeeper’s quarters, outhouse, storage house, and the acreage that the structures reside on. 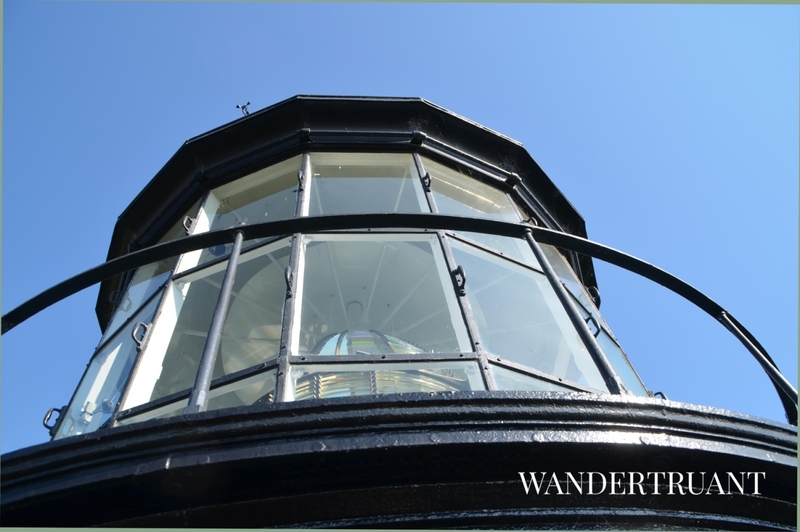 The history behind the lighthouse was fascinating to learn, and as you climb the first two sets of stairs each landing presents a museum quality information exhibit about the history of the lighthouse and the area. The stairs are broken up into flights of 30 stairs per set, with a landing in-between that weary climbers can catch their breath on. If you are afraid of heights, don’t look down; the stairs are dotted with various size holes that you can see straight through. I am extremely out of shape, so I was very glad I had chosen to do this in the morning; the day was already warming up, and the lighthouse lacks air conditioning. Despite my being mildly winded, the climb to the balcony only took roughly 20 minutes. The descent was much easier, took a little less time, and was just as interesting as the climb up. This was my first time in a lighthouse on the east coast, and it was an amazing birds eye view of the North Carolina coastline. The next item on the agenda in the tiny town of Corolla was a wild horse tour on the beach and through the Currituck National Wildlife Refuge. Check back in to learn all about the Colonial Spanish Mustangs who call the Outer Banks home. This looks just lovely! I have always wanted to go to a lighthouse. I love the Outer Banks! I haven’t climbed the lighthouse but it looks amazing. Headed to Corolla on Sunday. My family has been making the 12ish hour pilgrimage from Massachusetts for the last 15 years. I love the northern part of OBX. We usually see dolphins in the morning and have on more than one occasion had renegade wild horses traipsing through the dunes near the house we rent. 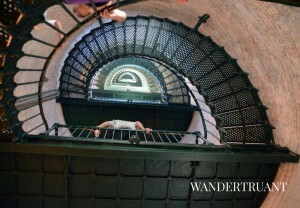 Haven’t made it up the lighthouse stairs yet, maybe this year!